I am constantly stepping on small cars, rubber ducks, and Legos. My son loves all things boy and is constantly pointing out "boy stuff" to me. Paw Patrol? "Boy stuff mommy" fishing and hunting? "boy stuff mommy" So when recently, we were able to check out Lil Troops and allow him to play with them he was so excited when he saw them. He quickly took to the recruit calling him daddy. It was perfect as playing with these little guys is not only fun, but reminds him of his dad while he is away. 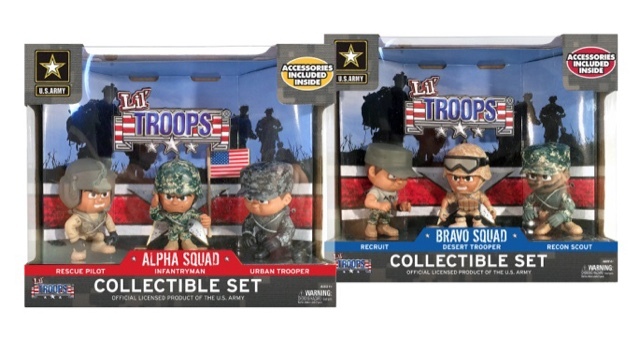 Lil Troops are these adorable small action figures that benefit the U.S. Army MWR services through sales. You can find them in store like the PX and Toys R Us (and of course online!) in singular packs and now in packs of three! When they arrived D was over the moon excited! I wish I could insert his surprise face because it is completely adorable and he ran around the house with them yelling, "Daddy guys!!" in excitement. That was a few weeks ago...D still plays with them every day. In fact for bed time he is allowed to pick two toys to take to bed with his water cup and his beloved dinosaurs have been replaced some nights with Lil Troops. We decided within the first two days of having them that we would get D the rest of the set. When I was browsing for the other Army series action figures I noticed I can also find these adorable (probably not a "cool" word my son would want me using to describe his toys) things come in football players too! University of Michigan and University of Georgia - We soon will splurge on as well. For now though we will round off the Army collection and buy him the missing ones to his collection. If you have a small boy in your life these sport action figures are seriously perfect for them. Lets face it - Boys love everything that is "boy stuff" and these are just that! Not only are they perfect as a gift or collectible, but they also benefit a great resource that so many of our military families use. The MWR has been amazing to my family and just knowing that part of the sales for these little guys go to them is enough reasoning for me to spoil my little guy some. You can visit thier website http://www.liltroops.com and quickly find the right one/s for your little guy! للفوركس أساليب كثيرة في الاستثمار وطرق وأسرار عديدة لا يعرفها حقاً الا من دخل في هذا العالم وقام بالتداول بنفسه.. لذلك قررت أن أجلب لكم بعض المساعدة في هذا المجال لكل من يهتم بمجال الفوركس وتداول العملات الشيق الجميل. في بداية استثماراتك لابد أن تتجه مباشرة إلى افضل شركة فوركس وهي بانكو افكس البريطانية الحائزة على جائزة افضل شركة فوركس لعام 2015 وعام 2016 على التوالي والتي تقدم أيضاً بيانات هامة عن تجارة الأسهم وليس العملات فقط، فمثلاً من هنا يمكنك أن تجد بيانات سعر البترول اليوم وهي بيانات محدثة دائماً عن أسعار البترول ومقدمة عن طريق شركة ماركتس الغنية عن التعريف. بانكو افكس تقدم أيضاً نسختها الكويتية في فوركس الكويت التي تقدم المساعدة للمستثمرين في دولة الكويت وأيضاً تقدم المساعدة لكل المهتمين بتجارة الأسهم وتداول الراجحي الذي ساعد العديد من الأشخاص على تحقيق الربح الوفير لهم.